Katrina Gumabao is no stranger to the international modeling scene. In fact, the Filipina plus-size model also made us proud when she first walked for Melbourne Fashion Week last year. This time around, she's all set to conquer the runways of Paris. "I'm turning 30 in September. Last year, I told myself I want to spend my birthday in Europe. 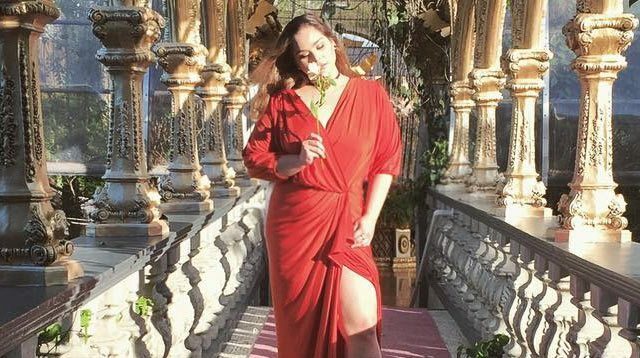 I'm super happy kasi birthday gift sa akin ni Lord 'to," she tells us, referring to her upcoming stint at Pulp Fashion Week Paris where she'll be the only Pinay to represent plus-size women who are making their mark in the fashion world. In an exclusive interview with Preview, Katrina shares with us her inspiring story, her spiritual well-being, and why there's no stopping her from achieving her dreams. Hi Kat! So we heard that you'll be walking for the upcoming Paris Fashion Week. Can you tell us more about it? Which shows will we see you in? "I'm walking in September 2017 for Pulp Fashion Week Paris. It's what they call the plus-size show. As per exact show assignments, they haven't given us the lineup yet." Can you share with us how the casting went about? "I saw online that they were casting. I emailed them asking if I can submit my portfolio. They emailed me back and said they would take a look at it, so I sent it. And they got back to me saying that I got in." This isn't the first time you're walking for an international runway. You were at Melbourne Fashion Week last year too, right? Do you still get nervous? "This will only be my third 'official' runway. Of course I'm nervous! I don't think I'll ever be not nervous." Let's talk about your childhood. Have you always dreamed of becoming a model? "NOOOOOOO. I mean, I loved getting dressed and fixing up. I always thought I'd be serving in public office or become a psychologist or even a lawyer at some point. The closest to modeling [that I dreamed of] was hosting…because I love to talk! (Laughs)"
We also know of you as an advocate for body positivity. Please share with us your personal experiences with body shamers and how you deal with them. "At a young age, my [personal encounters with] body shamers were with close friends and family—which, come to think of it, is even more painful than with strangers—but they would always joke about it and take it very lightly. So I did, too. Maybe that's why I wasn't super affected then. But as I grew older, the circle began to broaden [and it included] friends of friends, especially the boys I had crushes on. But since I was 'trained' to take it lightly, I just brushed them off without addressing the issue. "I wasn't as confrontational then as I am now. Now, I will really confront you about it. Not because of anger, but because I think (body) shamers lack knowledge on the subject." What advice could you give other plus-size women who are struggling with self-confidence and body shaming issues? "Confidence in yourself starts from within yourself. First of all, know that you are LOVED by the Lord who is perfect in all ways! Meaning, if our perfect God loves you perfectly, who is a man to judge you and condemn you? "Second, know that because He loves you, you have to learn to love yourself—whatever form you are in today and every day. Your circumstances may change, but the love you have for yourself shouldn't. "Third, the moment you learn to love yourself, pay it forward and love someone else. Not necessarily in a romantic way...but be an instrument for someone to find their way to self-love. "We often forget that the most basic solution can be found within us—the ability to love and accept ourselves so that we can love and accept others as well. You are your own enemy. So chin up princess, or the crown slips." How much does it mean to you to be a representation of plus-size women who are able to pursue their dreams and break away from the norm? "It means the world to me. "I've always felt that I was put on this earth for more. I wanted protect those who can't protect themselves. I wanted to help people solve their problems. I wanted to be a source of inspiration. I wanted to be able to make people feel good about themselves. I wanted to start change. I wanted all of these since I was young. "I just want to be heard, because I know that there is someone out there who might be experiencing the same thing as me. And to receive and read messages about how much people have started to believe in themselves because they've heard my story is beyond rewarding. But I want everyone to know that I am not that strong; I am weak, too. There are days when I wake up and I'm not happy with myself. I also have days when I question what I am doing: Is it right? Will I survive with this advocacy? Will I be able to make an impact? Will I be able to help people? Am I wasting my time? "But the Lord is good and He is just and He is faithful and He loves me. He keeps me strong every day. He reminds me every day of how worthy I am in His eyes and how much He loves and believes in me. And only because of the strength and inspiration from Jesus, I get to do all of this. "My goal is to keep inspiring not just people of size, but people in general."